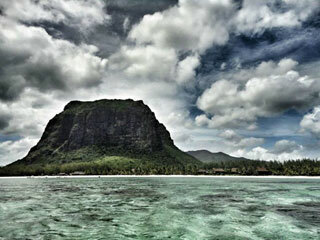 Le Morne Cultural Landscape, a rugged mountain that juts into the Indian Ocean in the southwest of Mauritius was used as a shelter by runaway slaves, maroons, through the 18th and early years of the 19th centuries. Protected by the mountain's isolated, wooded and almost inaccessible cliffs, the escaped slaves formed small settlements in the caves and on the summit of Le Morne. The oral traditions associated with the maroons, have made Le Morne a symbol of the slaves' fight for freedom, their suffering, and their sacrifice, all of which have relevance to the countries from which the slaves came - the African mainland, Madagascar, India, and South-east Asia. Indeed, Mauritius, an important stopover in the eastern slave trade, also came to be known as the Maroon republic because of the large number of escaped slaves who lived on Le Morne Mountain. This article uses material from UNESCO World Heritage List article "Morne Brabant", which is released under the Creative Commons Attribution-Share-Alike 3.0 IGO License.